Here’s the deal, Pete Carroll: Jim Harbaugh is one up at this level. 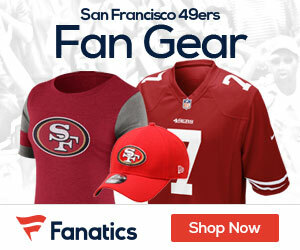 Ted Ginn Jr. returned a kickoff and a punt for touchdowns in a minute’s span late in the fourth quarter, and the San Francisco 49ers gave Harbaugh a 33-17 victory over the Seattle Seahawks in his much-hyped NFL debut and renewed coaching rivalry with Carroll. 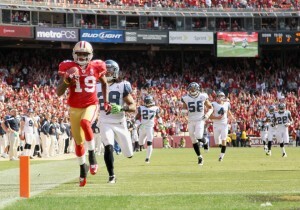 Ginn ran a kickoff back 102 yards moments after the defending NFC West champion Seahawks had closed within 19-17. It was the second-longest kick return at home and fourth-longest in team history. He then scored on a 55-yard punt return. It was the first time in 49ers history they had a kickoff return and a punt return for touchdowns—let alone by the same player. New Seattle quarterback Tarvaris Jackson(notes) threw a late 55-yard touchdown pass to Harbaugh’s former Stanford star, Doug Baldwin(notes), in his Seahawks debut as Matt Hasselbeck’s replacement. Harbaugh pulled Smith into a seconds-long bearhug after he hustled to the sidelines after his short TD run just before halftime in which he spun into the end zone to put the 49ers up 16-0. Ginn saved the game with a huge day on special teams. This is the guy who returned kickoffs of 100 and 101 yards for touchdowns in a 30-25 win for Miami over the New York Jets on Nov. 1, 2009. With his parents, Jack and Jackie Harbaugh, in the stands to cheer him in the opener, the former NFL QB was as animated as ever—waving his arms, pacing the sidelines and congratulating his players at every chance. Rivals dating to their days in the Pac-10, Carroll couldn’t complain about Harbaugh running up the score in this one. Seattle’s offense had enough problems for Carroll to worry about what was happening on the other sideline. The two quickly shook hands afterward and called it good. It was Carroll who in 2009 met Harbaugh at midfield postgame with a “What’s your deal?” after Stanford ran up the score in a 55-21 rout at Southern California and even attempted a late 2-point conversion with the game out of reach. In Harbaugh’s first season in 2007, the Cardinal traveled to Los Angeles as 41-point underdogs only to stun the second-ranked Trojans 24-23 and end their 35-game home winning streak. Jackson, Brett Favre’s backup in Minnesota the past two seasons, completed his first six passes but was sacked twice in as many drives to start the game— by Ray McDonald and Justin Smith —and five times total. He was 21 of 37 for 197 yards and two TDs with one interception. First downs were scarce and San Francisco’s defense stingy behind defensive tackles McDonald and Smith. The 49ers were 0 for 9 on third-down conversions before Smith’s 12-yard completion to Braylon Edwards early in the fourth. Edwards wound up with three catches for 27 yards in his 49ers debut. He was given a fresh start by another Michigan man, Harbaugh. Back on a one-year free agent deal when most everybody figured he’d turn up elsewhere, Smith generated cheers instead of boos from the home crowd. He made quick decisions and scurried out of trouble several times with defenders coming right at him. One telling moment Sunday: Jackson was sacked by Parys Haralson, who forced a fumble that was recovered in the air by Will Tukuafu on his first career play from scrimmage. That set up Akers’ second field goal. What a difference from last year’s opener between the division foes. The 49ers lost at Seattle 31-6 last September on the way to a surprising 0-5 start that dashed San Francisco’s hopes of winning the division. The 49ers returned the favor with a 40-21 home win in December but it wasn’t enough to save then-coach Mike Singletary’s job. Harbaugh was hired away from Stanford on a $25 million, five-year deal to turn around a franchise that has gone since 2002 without a playoff berth or winning record. Be the first to comment on "49ers Smash Seahawks 33-17"